Visual, 14” x 19” approx. 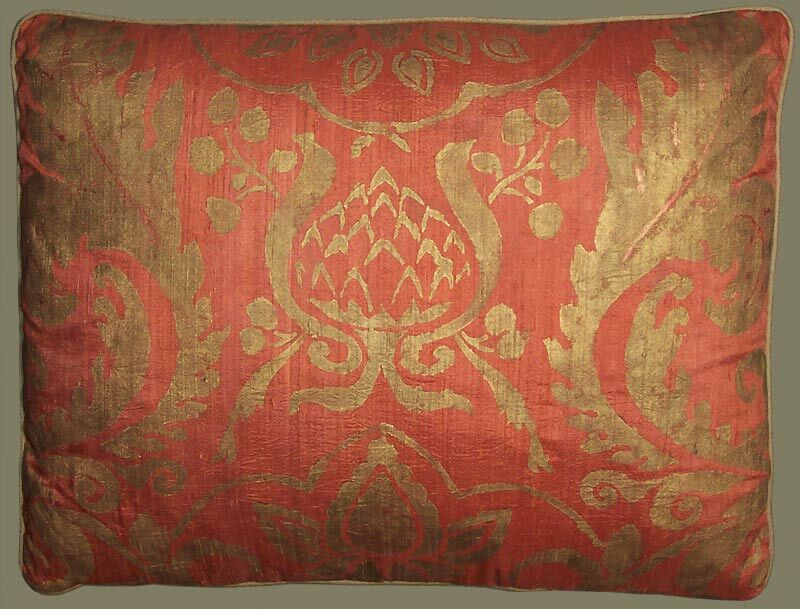 Description: A Pair of Decorative Pillows Which Evoke an Olde World Flavor. A Carol Tate Original Hand Stencil Printed Design Influenced by French and Italian 17th and 18th Century Euro Motifs, as well as Spanish Mediterranean Baroque. Eco Friendly Reclaimed Silk Doupioni Fabric is Over Dyed in a Ripe Tangerine and the Floral Surface Design Hand Stencil Printed in an Antique Brass Metallic. Green Gold Silk Welt Cord as Detailing. Feather Down Inserts and Hand Stitched Closure. A One of a Kind Pair of Fashion Accessories for the Home. Dress That Traditional Sofa or Settee in This Pair of Artisanaware Throw Pillows, or Use to Accent Comfy Upholstered Chairs.